Posted bykaat	 March 14, 2014 March 14, 2014 Leave a comment on Spring? This has been/still is a hard winter. It’s been one snow storm after another, with long stretches of below freezing temperatures. Three weeks ago I caught a bug which developed into pneumonia – hence the silence here – and now that I’ finally up and about, Amie caught something as well. That’s how it goes. The winter was hard on the bees as well: all three colonies are dead of starvation in boxes still half full of capped honey. They just didn’t have the chance to break cluster and move toward the honey. But things are stirring. Before yesterday’s snow flurries we actually saw dirt. Then it got covered up again, but all that should be washed away by tonight’s rain and tomorrow we may see some outdoor activities. I plan to wash all the seedling trays and pots so I can start the basement garden. If I’m up for it, I’ll also clean out the chicken coop: there’s some good compost in there after months of deep litter. A couple of days ago I (hot-water-bath) canned the sauerkraut that had been fermenting in big jars on my counter for seven weeks. 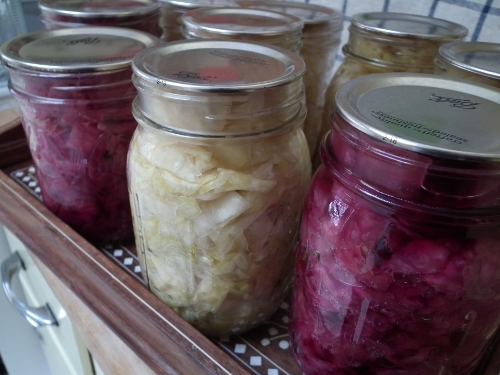 I usually don’t can kraut as it pasteurizes it (duh!) and kills off all the good bugs. Still, I had too much of it to keep in the fridge, and as I’m the only one who eats it round here, I decided to reserve one jar for the fridge and can the rest. I hope the canning doesn’t make it too soggy. I like it crunchy.